Pickering is the busiest gateway to the North York Moors and this - the town’s best circular walk - serves as a good introduction to the National Park. 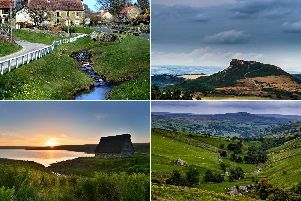 The first section closely follows part of the famous North York Moors Railway as well as a stretch of Pickering Beck. Here, the route passes a series of embankments which now protect the town from a repeat of the flooding which in 2007 caused £7m of damage. A steep climb out of Little Park Wood is followed by some gentle field paths then a lovely walk back to Pickering through the woods of - despite the name - peaceful Howl Dale. Watch for herons along the beck, jays and great spotted woodpeckers in woodland. 1. Start from Pickering station in Park Street. Walk north on the opposite side of the road on what soon becomes Undercliffe. Cross to the west side of the road to continue on the pavement, with Pickering Beck on your left. When a small green appears on the right cross with care. 2. Follow a drive towards an elegant building, Lowther House. Beyond it go through a kissing gate and follow a clear path which rises to proceed along the bottom of Lowther Wood. Ignore a gate on the left but at a well-made kissing gate further on leave the wood and angle right towards a bridge over Pickering Beck. Don’t cross but turn right to an information board and follow the path along the bottom of Little Park Wood. The path eventually rises gently right and becomes a track. 3. Where a wall slants downhill through the wood turn right to follow the clear path uphill. Cross a forestry track, and higher up at a waymark post take the left fork. Go over a stile and walk ahead to arrive at the busy A169 Pickering-Whitby Road and boundary sign for the North York Moors National Park. 4. Cross with great care and go over a stile to follow a path along the edge of Scalla Moor Plantation. Continue out of the trees to follow a field edge. Cross a stile and proceed downhill to go over another stile and walk a short distance ahead to turn right on the track through Howl Dale. 5. At the end of the woodland the track reaches a clearing. Bear left, and further on follow the waymark arrow right to walk between a hedge and fence. Soon, turn right to follow the fenced-off path west along a field edge, passing a farm then walking along a residential street, Ruffa Lane. Go left at the end to return to Pickering town centre. Public transport: Pickering is served by buses from Leeds, York, Malton, Helmsley, Scarborough and Whitby. For all times visit www.traveline.info or call 0871 2002233 (charges apply).